Welcome to Custom Garage Works! 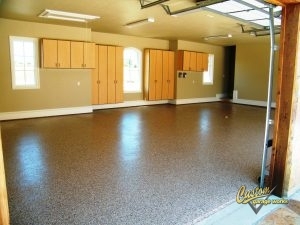 Recognized for our custom garage floor coating in Wilmer, TX, we first began our company in 2003. While we were unable to locate the services we wanted within the industry, we did not let that stop us, but instead, we decided to join the industry ourselves. Today, we offer some of the greatest garage storage cabinets in the business, as well as high quality polyurea polyaspartic floor coatings that last years longer than traditional epoxy floor coating. Our contractors are professional trained, and we are passionate about creating custom garages, with impressive garage floor coating results across DFW. Out of all of our services, our most common services is the polyurea polyaspartic floor coating in Wilmer, TX. This boom in popularity is likely because our coatings are stronger than epoxy, and cure in a shorter amount of time, which means that you can use your garage within 24 hours in most scenarios. Unlike epoxy that will yellow in the sun, and peel or flake over time, these coatings are stronger and more resilient. In addition to our floor preparation, which incorporates professional diamond grinding, as opposed to acid etching, you end up with a showroom quality floor that is easy to clean, and practically indestructible. Give us a call at 214-494-9068 or 817-308-1305 for your free estimate today, and we can tell you more about our professional garage floor coating service. Garage Floor Grinding Our garage floor grinding service is the best way to properly prep your concrete for a coating system. Polyurea Polyaspartic Coatings These coatings are particularly durable, as well as resistant to heat and UV rays. And More! You can learn more about the garage floor services we offer here! When you are running out of space in your garage, Custom Garage Works has the right garage storage and organization solution for your home! We know that a brand new garage floor looks best when it isn’t covered by other items in your garage. We provide a selection of solutions to organize your belongings, including overhead storage racks and garage cabinets. We carry some of the most resilient overhead storage racks in the industry, and our storage cabinets are specifically made for garage needs. If you need a reliable garage floor coating in Wilmer, TX, and unbeatable organization solutions, you can depend on Custom Garage Works. Overhead Storage Racks Do not waste your overhead area! Our overhead storage racks help you get more out of your garage. 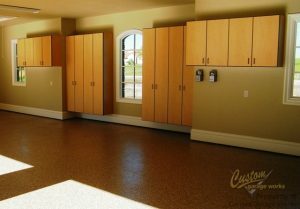 Storage Cabinets Our custom garage cabinets are specifically created to be stronger, and to resist extreme temperatures. Car Lifts If you ever wanted your garage to be a showroom, our garage auto lifts are a great place to begin.